a police unit with more authority than the area police. Vehicle licenses and badge numbers should be investigated to determine where WE would be running afoul of the laws. Shame on those who did this. So the two years of D&W was illegal and the clowns now discover that? No wonder they have an abysmal detection rate. wagonrunner wrote: Called Arima Police station 657-3563 asking for info for CARS event. (what permissions would be needed, etc). Was told to call 667-0501 and speak to a Mrs. Choti (spelling). Have the permission of the property (Which we all do, it's rented from them). Are not exceeding 200 ppl. (ARA may be the only ones who do). We are fine to host our events. On the note of EMA, I was asked to call back and speak to Sgt. gerald when he's free. Though she noted our agreement with ARC stipulates not loud enough to disturb the horses in the adjacent compound, and as such would require no variance. All of the above we have since confirmed as Very accurate. And we have also confirmed that the police indicated that the Borough Police had no jurisdiction - Very FALSE. Bold and blatant use of force by the evil and wicked with connections to certain security personnel! And again I ask when we see all the crime on the front pages of our newspapers on a daily basis, we are all stunned. But when you harbour criminals using filthy money, you lose your sense of integrity, honesty, and ultimately sense of respect for even your family, all of whom are exposed in this pervasive scenario. This information needs to be relayed to the respective clubs that use ARC for motor sport in a printed and signed hardcopy and should include the name and badge number of the official that signed. Just throwing it out there as a suggestion..... cant CARS, AutoSport and TTKA come together as they all share the facility, hire a good lawyer and get some sort of legal document giving permission for all the events for the calendar year? As much as these things cost money and is time consuming it may be worthwhile to explore this option. Just my 2cents as supporter and occasional competitor of the events. not sure what's the difference between Borough police and regular police though..
All these tuners and not one lawyer willin to stand up for motor sport? wagonrunner wrote: Called Arima Police station 667-3563 asking for info for CARS event. (what permissions would be needed, etc). To add a further note on the EMA, AutoSport has in its possession 100 signatures from the residents adjacent and around the racing area. This was provided when my good friend paid and engaged the EMA in providing the requirements necessary. These requirements included providing decibel level readings from the closes residential house and from the ARC private members car park located north to the race area. Some of the levels were provided and submitted by Street Wise Sound specialist in the first instance in the form of a report, and by the EMA in the second. All of this was provided and accepted without issue. There is no real reason to justify what happened yesterday, we can only conclude that corruption is alive and well in T&T, do not contribute to its continuity on the 26th of January. God is watching !! For the uninformed...what happening on the 26th? moti wrote: There will be the ones who will say "You see me all I want to do is race and I don't care about the politics". These are the ones that still have the ALI camp alive even though they not directly supporting them. If the action taken was without just cause a complaint should be filed with the Police Complaints Authority. My opinion is NARA is made up of the TTASA ilk. NARA's members are TTASA's past members, and until the supposedly "new" TTASA distances itself from NARA and "old" TTASA's practices, I have reason to see them as one and the same. Where was TTASA defending this event? To stand aside is to let it happen. There are two things that separate the Evil from Good in T&T Motorsports. The Persons who Study MONEY vs the persons who actually LOVE the sport, its growth and its future. The twist is that the Racers and Spectators if they think smart can manipulate what happens but as I always say and moti mentioned are the ones who say '' "You see me all I want to do is race and I don't care about the politics". THIS IS HAPPENING IN MOTORSPORT TODAY, BUT IN A SLIGHTLY DIFFERENT MANNER! THE_FUGITIVES wrote: There are two things that separate the Evil from Good in T&T Motorsports. The Persons who Study MONEY vs the persons who actually LOVE the sport, its growth and its future. turbo boost wrote: i am yet to understand the lack of support from people who claim to love the sport, after not having a track for so many years some stay at home during N.A.R.A. events in d name of "fight down" and officials from N.A.R.A supports any other drag racing events. N.A.R.A please continue in your well doing you have the support of the Tobagonians. In the NARA thread the guy denies they had anything to do with it. So unfortunate it happened though. Anyway, did anyone time the runs with a stopwatch? From the vids it seems the runs are over 60 seconds. pete wrote: Anyway, did anyone time the runs with a stopwatch? From the vids it seems the runs are over 60 seconds. Both of those vids show approx. 60 sec runs based on the camera's clock. Times will improve after people run a few times on the new course. Looks like it's going to be lots of fun ! So wait, all of allyuh was in non-event on Sunday? 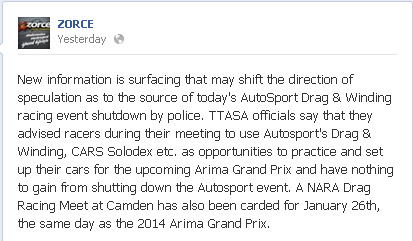 AutoSport wrote: So wait, all of allyuh was in non-event on Sunday? And if I knew a bit earlier Sayuri and I would have been there also.